I’m excited to be showing in another state. I made the piece below for the “Red Death Masquerade” show at One Wicked Gallery in North Carolina. Here are a few progress photos. I found a really nice paper at Michael’s (I ♥ Michael’s!). I glued it to the board and painted it. Then painted the dog skull on top. This piece took a little bit longer to finish than I thought. I can’t help but use a very small brush. Below is the finished piece. Here’s the show flyer. If you’re in the Wilmington, NC area please stop by and see the show! a benefit for the Los Angeles Food Bank. I was live painting there and was able to finish a new painting. There were several other artists working there as well. Click the image below to watch the video. I had tons of fun. 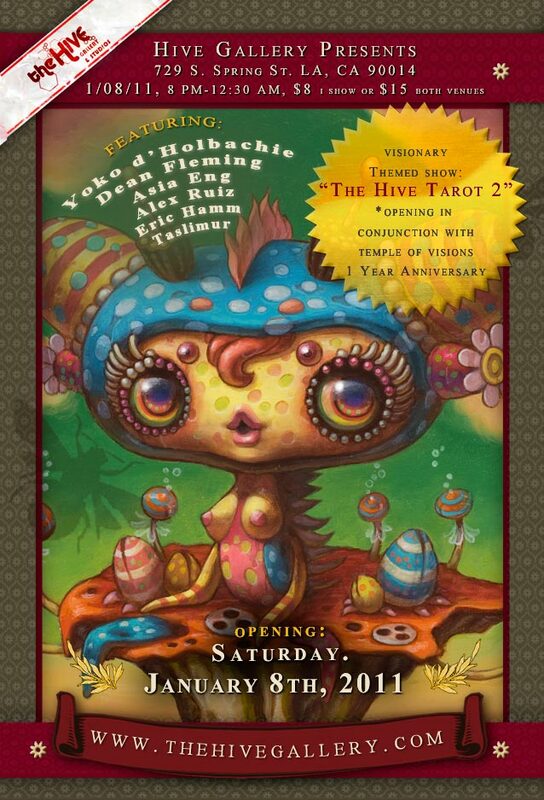 Tarot card show at The Hive! My “Ace of Wands” piece was made specially for this show. Lots of great art to see. See you there! “Apopcalypse” is a group art show exploring the apocalypse and its aftermath through pop art. The show features works speculating these events and environments by up and coming artists, diverse in style and background. The show is curated by The Head Shop and Brunch! Magazine! and will coincide with the release of Brunch! Magazine! Issue #3: The Brunch After Tomorrow. The opening will feature snacks, drinks, free portraits (for a nominal fee) and music spun by DJs Jesse Bobby, Landon Calrissian and Malcomesque! I will be showing my silhouette zombie paintings. $50 each or all 5 for $225!! I’ll be showing at The Long Beach Experiment this Wednesday, August 4th. One night only! I’ll be showing lots of small paintings. Nothing over $50! I may also have some free gifts for people who attend 🙂 Make sure you tell the door person you are there to see Jinx. See you there!